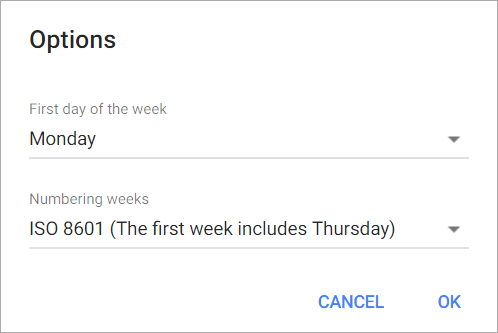 Weeks settings enable you to choose the first day of the week and select the standard for numbering weeks in a year. Default values for the first day of the week and numbering weeks are set in Slemma Account settings (click your profile icon at the top right corner and choose Settings). For the imported data sources, weeks settings are set in the Dataset editor. For SaaS connectors, weeks settings are set in the Integration settings window (right click the integration and choose Integration settings option), on the Advanced tab. Once the weeks settings are specified for the integration, they will affect all the datasets created on it. For the Postgres DBs, weeks settings are set in the Dataset editor. Other DBs don’t support week settings at the moment. Choose the first day of the week (e.g. to aggregate data by weeks in a chart). Sort Date dimensions by Day of the Week and Day of the Week – Name in a chart. Aggregate data by week level in a chart. By default, the first day of the week is Monday. ISO 8601 (The first week includes Thursday) – the first week of the year includes the first Thursday of the year, the second week starts from the next Monday. American (The first week includes January 1) – the first week of the year starts from January 1, the second week starts from the first Sunday. If English language is selected in Slemma Account settings, American week numbering is set by default. If Russian language is selected, ISO 8601 is set by default.